Damon Albarn's cartoon band Gorillaz are promoting their new single by offering a free videogame for fans to download. Gorillaz are set to release a new digital bundle of their song 'Superfast Jellyfish' which includes a computer game today (March 29). The digital bundle for the song, taken from recent album Plastic Beach, includes the so-called game, Escape To Plastic Beach. We have given the game a quick go and, while the characterisation and artwork and dialogue are to be commended, the gameplay value is an unfortunate zero out of ten. However, lets hope that other bands and musicians pick up on the trend and start to also employ some talented games designers, in addition to some writers and artists to make mini interactive games to promote their music. 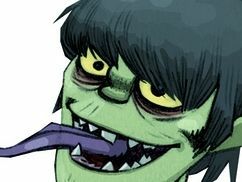 Head over to Gorillaz.com for more on the new album (which rocks) and the new game (which is rubbish).